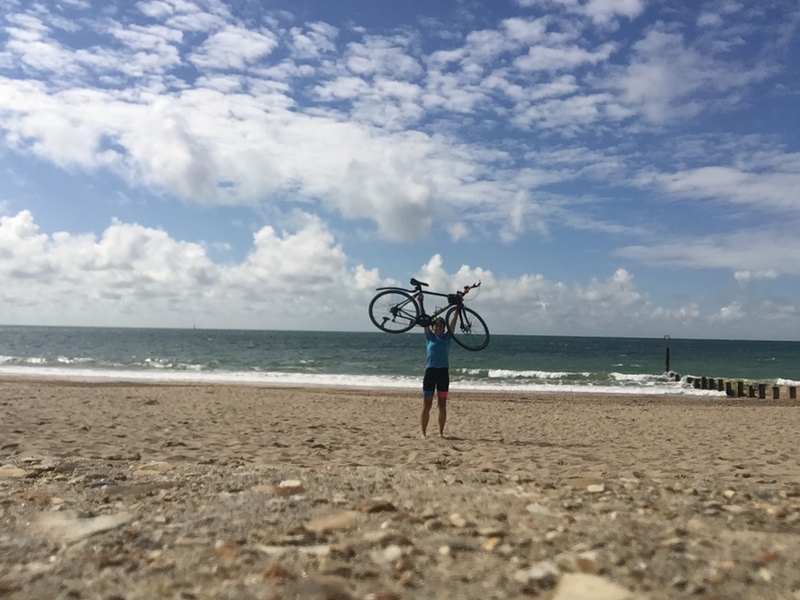 On 31 July, I set off from London to cycle to Bridport, Dorset for my friend Lusea and James’s wedding – yet another transport challenge under my own steam that I welcomed! I started day 1 well, feeling relatively well rested but nervous. The weather was good, around 20 degrees, sunny with a bit of wind. After riding through Wandsworth and then Putney, I cycled through Bushy park, following almost the same route that I did when cycling to Portsmouth a few weeks earlier. It wasn’t long before I was back on my favourite ferry, chatting to the driver about how there was bad weather scheduled for the days ahead. The driver was saying how he enjoys sailing the ferry in bad weather, as it’s a challenge to get to the other side – not quite the same as how I feel when riding in bad weather! Even though I had already completed almost half of my distance for the day, I struggled to get into my rhythm, finding it hard to be riding on my own since my previous ride was with my cycling buddy Kieron Ramsay. Still I got my head down and battled on, knowing it felt fantastic being on the bike and outdoors all day on a Monday, rather than being at work! Sticking to the canal path, the path went under a large bridge with lots of graffiti scattered around, one of which said LAGER in bright, bold style. Being a huge lager fan, I had to stop and take some snaps and after, couldn’t think about anything other than a cold pint at the end somewhere. The canal paths were challenging to ride on at times, as there were tree cutters out and some paths had debris all over the stop. Still it was quiet and peaceful, with hardly a person or cyclist in sight. Where exactly am I meant to ride?! Coming off the canal path, I ventured onto the quiet open roads, crossing various railways lines along the way. As I reached the outskirts of Southampton, the roads got a little busier. I’d been riding for several hours and it was almost 7pm, so I slowed down to make sure I got there safe and sound. I arrived at my Air B n B for the night in Totton at around dusk. Howard and Helen were so welcoming and congratulated me on my ride from London. The house was lovely and cosy and the room had everything I needed and more for the night. View my London to Totton route on Strava here. After a great nights sleep I was greeted to a cute white and ginger cat outside my bedroom door. Too cute to not have a cheeky snap with! After some breakfast and a cup of coffee I set off for my final destination, Bridport. The weather was on my side again, with a bit more head wind, but lovely and dry. Within just 5 minutes of riding I entered the beautiful New Forest, with wild ponies and cows hanging out freely amongst the cars and people – a stark contrast to the London life I left a mere 24-hours ago. I reached the seafront just before the city of Bournemouth. It was a real treat to see the sea and the perfect opportunity to stop for a bit of a break, take my shoes and socks off and put my feet into the sand – had to be done! Riding through Bournemouth was pretty, but busy and very hilly in parts. I saw a sign that said no riding during July and August in the day along the promenade, which was where my planned route was taking me. So instead, I went in-land to cut through, meandering through residential roads, passing some beautiful houses situated in a pine-forest, didn’t seem real! I stopped for a brief spot of lunch in a pub and left re-energised after some food and drink, and quickly got into a good rhythm. The roads were quiet, beautiful, passing through some forests and picturesque towns such as Wareham and following the Jurassic coast. I headed onto the National Cycle path 2 to Dorchester, stopping in Dorchester for some coffee, cake and to recharge my batteries for the final leg. I left feeling very tired with a sore body and mind! I got my head down and focused, knowing Bridport was in sight, which also meant a full two nights and a day’s rest off the bike. The scenery got more a more beautiful, but also incredibly hilly and perhaps some of the most challenging I’ve ever encountered cycling in England. With less than 15 kms to go it was getting hillier and hillier and really making me crack. I had to stop at the top of one of the climbs for a lie down and to compose myself to continue on. I just need a lie down for a minute! Approaching the downhill I could see signs for Bridport and less than 5 minutes later had arrived! It felt so good to finally be here, knowing tomorrow I would be celebrating Lusea and James’s wedding with my best friends – what a great end to my ride from London! View the route from Totton to Bridport on Strava here. I woke up feeling battered and bruised and to Gale force winds and rain over the quaint town of Bridport, apt as James’ surname is Gale. I felt gutted for Lusea and James on their wedding day, but they weren’t fazed whatsoever! It was a lovely little church ceremony, followed by lovely local food and drinks into the evening and a great dancing session to end! Despite the fairly late night, I set off early for Winchester. I felt tired and had a pretty bad hangover, but knew once I got going the riding would sort me out. It was overcast but dry and within minutes I was once again on the National Cycle path 2, winding through the most beautiful scenery. A few hours in and the clouds were getting darker and the wind was picking up. I was worried as had given all of my wet weather gear to my friend Hollie to take back to London on the train. I’d been checking the weather and it looked to be OK for my ride back, so I decided to risk it and ditch some of the weight I was carrying on my back. It perhaps was a big mistake as when the rain arrived, it was so heavy I was soaked in seconds. All I had was my thin waterproof jacket and there was literally no where for me to take shelter. I rode on and it was getting worse, with very poor visibility, so I decided to pull into someone’s driveway and try and take shelter – in their garage that was open thankfully! I stuck it out for about 10 minutes, praying no one was going to come out of their house, or come home! Taking shelter from the down pour in someone’s garage! The rain cleared so I set back out again, only to get more rain later on. It was really rainy and windy, with poor visibility and with very little wet weather gear, just no fun. At least my hangover had been blasted away by the wet, wind and cold! I stopped off in a MacDonald’s to shelter from the rain and recharge my stuff, as well as scoff down some pancakes and coffee. After some time spent trying to dry my socks and shoes off in the hand dryer of the women’s toilets, I set off once again, concerned about the time I’d lost taking shelter! The rain cleared quickly which I was incredibly thankful for. I took a wrong turn and ended up on a very busy road, but could see that the path I wanted to be on would cross the road I was cycling on. I got to the cross roads and realised the road was way above me, up a steep grassy hill and over some barbed wire. I decided to go for it as the alternative was turning around and adding on more mileage. Hurling my bike uphill to get back on track! I passed once again through the beautiful Wareham and with the sun coming out. I passed through Poole and followed the coastal path, risking the warning signs saying no cycling during July and August during the day. The choice was to risk it and not get caught, or take a big detour up hill, adding on more time and mileage. After risking it I was told off instantly by several people, annoying as the coastal path is so beautiful and the promenade was not busy. I decided to part walk, part cycle, which seemed to just do the trick. Passing Bournemouth and entering the New Forest, it wasn’t long before I saw wild ponies and beautiful forests. My final destination for the evening was the picturesque city of Winchester. It was even more exciting to get there, as one of my best friends, Mandy, was meeting me in Winchester, to join me on my final day’s riding the following day. I arrived in Winchester very tired, a bit broken and bruised, but thrilled to arrive and join my friend for some dinner and drinks. View the full Bridport to Winchester route on Strava here. Winchester > London, with Mandy! After a very restful evening, Mandy and I had a lovely breakfast at our Air B n B before setting off for our ride back to London. Mandy had previously done some big rides when she lived in Rome, but it was several years ago now, so she was a bit apprehensive about how she would find our full day’s riding. She’s also borrowed a friend’s bike for the day and had little time to make adjustments and prepare, only having made the decision a few day’s before to join me! We set off to a good start and within the first hour, we were out in the open road, making some good climbs. We passed some lakes and followed the off-road canal paths. Mandy’s borrowed bike was perfect, as it was more of a mountain bike with good tyres. Obligatory holding the bike up shot! So much fun riding with Mandy! After several hours of canal riding, we finally reached the graffiti tunnel I’d stopped at a few days before and once again, stopped to take some more snaps! We carried on speaking about how hungry we both were. Mandy was picturing penne arrabiata pasta and we were joking about how specific it was. We decided to stop in the first place we saw, which was an Italian restaurant on the canal path, serving believe it or not penne arrabiata, it was bliss and literally just what we wanted! It wasn’t long before we hit Kingston area and had less than an hour or so before we got back to Bermondsey. Mandy didn’t complain one bit and was just loving the ride. I was so grateful to have a best friend join me for one day and to be able to show them a piece of what Powered by Me is all about! We arrived in Bermondsey safe and sound and with about 45 minutes to have some beer before Mandy had to get the train from London Bridge to Tunbridge Wells. I was so proud of Mandy and so overwhelmed once again, that I had travelled so far, Powered by Me, to get to places I needed to be, this time a friends wedding in Dorset! View the ride from Winchester to London on Strava here. If you’re inspired by my human-powered year-long Powered by Me journey, why not donate to August’s charity, Dementia UK who help families cope with dementia through their Admiral Nurses, providing specialist assistance and support to carers and those with dementia themselves. Donate to Dementia UK now via my Just Giving page here, or text PBME81 to 70070, followed by the amount you want to donate. Previous Bressuire to Annepont, France + wedding day!